Exchange Server Suite is an emerged solution for recovery & Export EDB, OST & PST files into Live Exchange, Office 365, Outlook Profile Mailboxes & PST Files proficiently. 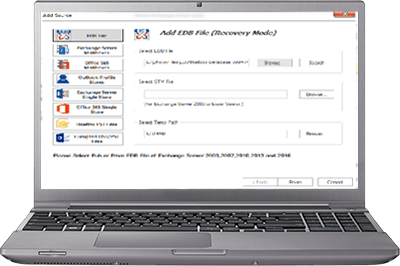 It allows to save the recovered Items in EML, MSG, RTF & HTML format. Beside this, the users can migrate Exchange server & Office 365 mailboxes into other Live Exchange Server, office 365 and PST files. Very impressive. 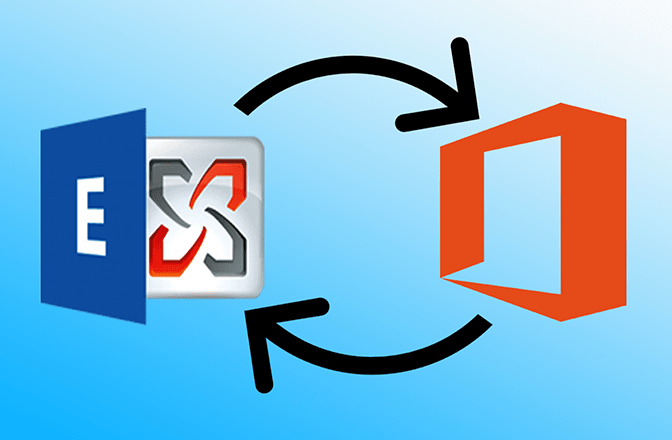 I used Exchange server suite to perform a cutover migration and it worked like a charm. Support team has an excellent job and always ready to assist in every crucial moment. I appreciate the effort you put-in. Well, will definitely give you 5 star for your great work. I have recommended exchange suite to one of my another client. GUI & user guide helps a lot to accomplish the task with minimum assistance. 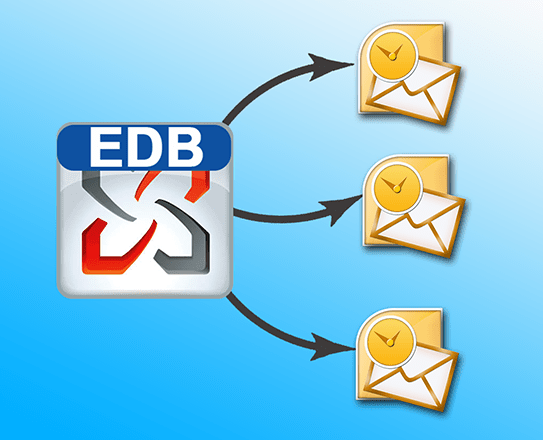 User can add multiple Mailboxes as a source in order to export and save Email Items. 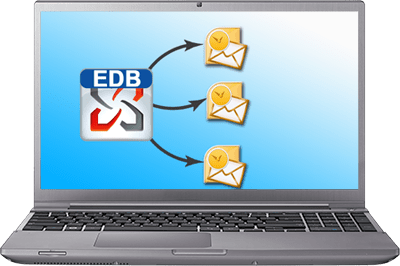 Added Mailboxes can be EDB Files, Exchange Server and Office 365. 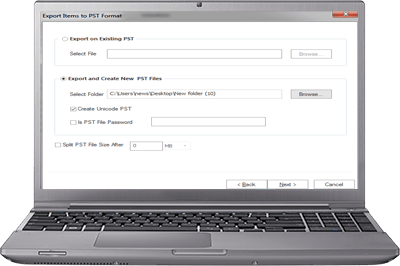 User can also add corrupted or non-corrupted multiple OST & PST files to recover and export it. 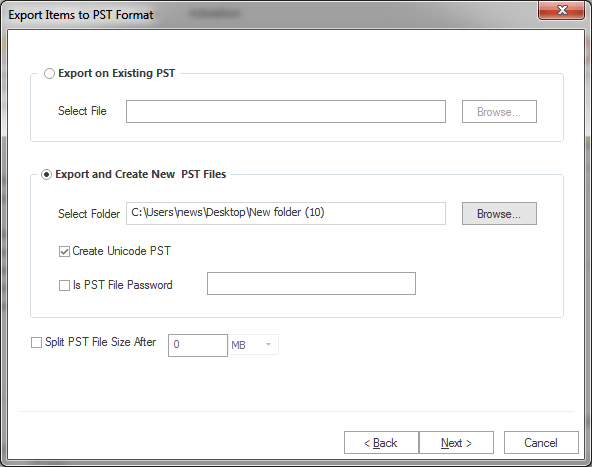 The tool also allows to add Healthy PST files in source and export into live exchange and Office 365. 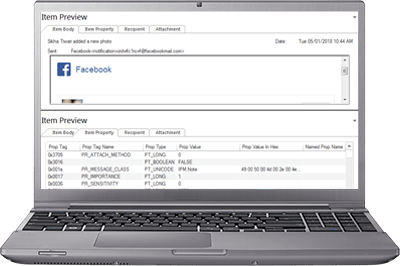 The eDiscovery feature allows the users to search specific items according to item property i.e. subject name, sender name, recipient name, attachment availability, date criteria etc. 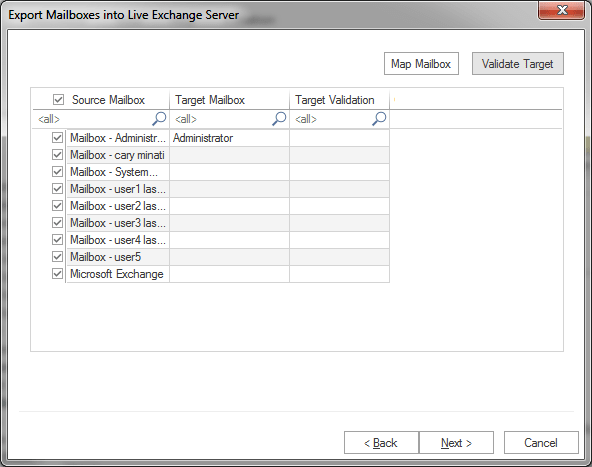 Users can export the added Live Exchange multiple Mailboxes into Office 365 mailboxes, Live Exchange Server mailboxes, Outlook Configured Profile Stores (Mailboxes) and Outlook PST files. 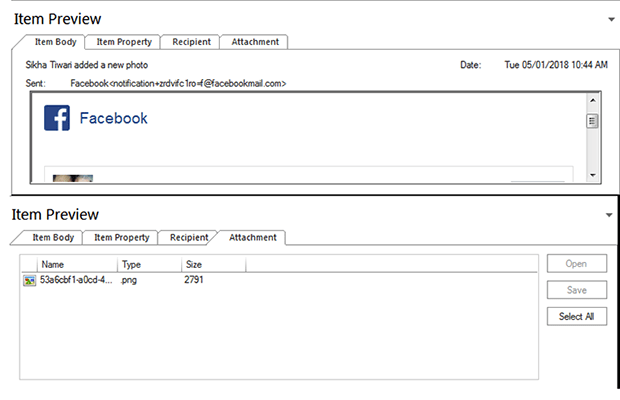 Further, one can export the added single mailbox into Public Folder, Archive Mailbox of Live Exchange & Office365. 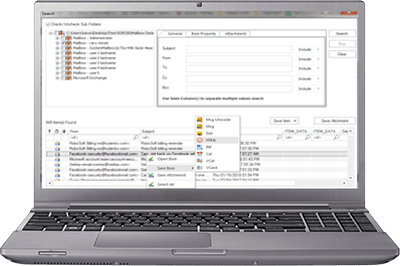 Apart from that, the software can also save items directly into the local directory in various formats such as MSG, EML, HTML, VCARD, VCAL, CAL, and RTF. The user can export added Office 365 multiple Mailboxes into Live Exchange mailboxes, Office 365 mailboxes and Outlook PST files. Further, one can export the added single mailbox into Public Folder, Archive Mailbox of Live Exchange & Office365. Apart from that, the software can also save items directly into the local directory in various formats such as EML, MSG, RTF, VCAL and CAL. 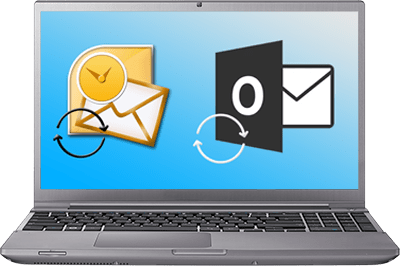 The user can export added Outlook Profile Stores into another Outlook Profile Stores, Office 365 mailboxes, Live Exchange Server mailboxes and Outlook PST. Further, one can export the added single Profile store into Public Folder/Archive Mailbox of Live Exchange & Office365. Beside this, the software can also save items directly into the local directory in various formats such as EML, MSG, RTF, VCAL and CAL. 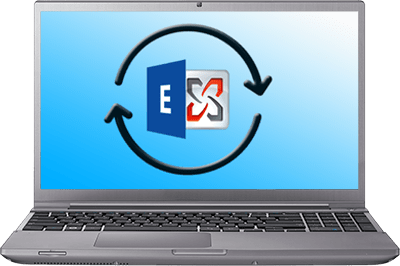 The user can export added Healthy multiple Outlook PST files into Office 365 mailboxes, Live Exchange Server mailboxes, configured Outlook Profile Stores, and new Outlook PST files. 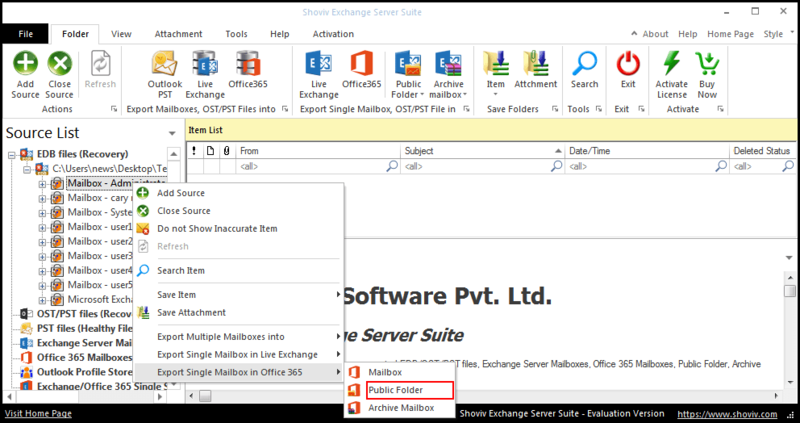 One can export the added single file into Public Folder, Archive Mailbox of Live Exchange & Office365. The software can also save item directly into the local directory in various formats such as EML, MSG, RTF, VCAL and CAL. The user can export Public Folder of added Office 365 and Live Exchange Server into Office 365 (Mailbox/Public Folder / Archive Mailbox), Live Exchange Server (Mailbox/Public Folder / Archive Mailbox) Configured Outlook Profile (Mailbox Store) and Outlook PST file. The software can also save item directly into the local directory in various formats such as EML, MSG, RTF, VCAL and CAL. The user can export Public Folder of added Office 365 and Live Exchange Server into Office 365 (mailbox/Public Folder / Archive Mailbox), Live Exchange Server (Mailbox/Public Folder / Archive Mailbox) Configured Outlook Profile(Mailbox Store) and Outlook PST file. It also allows to save item directly into the local directory in various formats such as EML, MSG, RTF, VCAL and CAL. 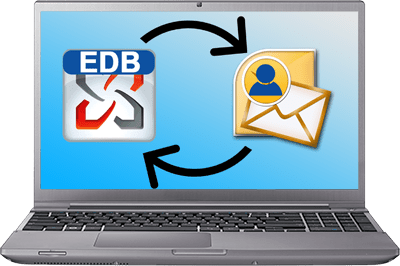 The user can recover inaccessible and corrupted Exchange Database (EDB files) and export into Office 365 mailboxes, Live Exchange Server mailboxes, configured Outlook Profile (Mailbox Stores) and Outlook PST file. 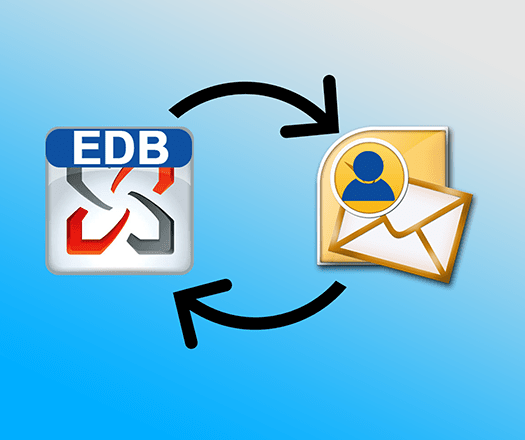 One can export the added source EDB file Single mailbox into Public Folder, Archive Mailbox of Live Exchange & Office365. The software can also save item directly into the local directory in various formats such as EML, MSG, RTF, VCAL and CAL. 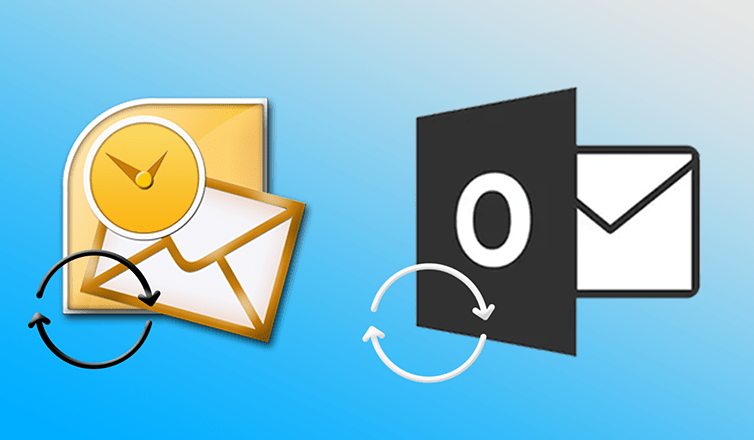 The user can recover inaccessible OR corrupted OST & PST file and export into Office 365, Live Exchange Server, Configured Outlook Profile(Mailbox Store) and Outlook PST file. 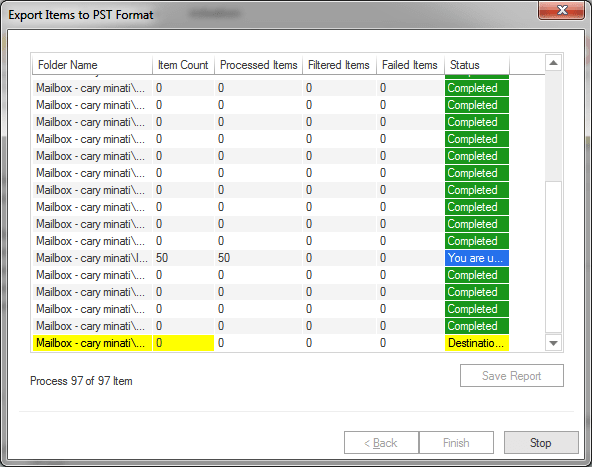 Further, the tool helps to save item directly into the local directory in various formats such as EML, MSG, RTF, VCAL and CAL. 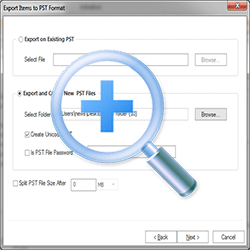 The "export source into PST" option exports individual source mailbox into separate PST file with owner's name unless there is no limit set for PST file by the user or by default in outlook. In case there is an upper limit is set, the mailbox will be divided into multiple PST files or you can set split size limit manually directly through software using the split option. 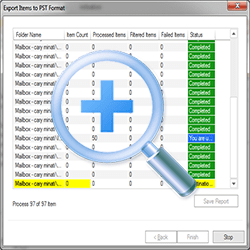 The software allows the users to filter and export only filtered items while exporting. The user can customize filter options based upon filter items properties i.e. 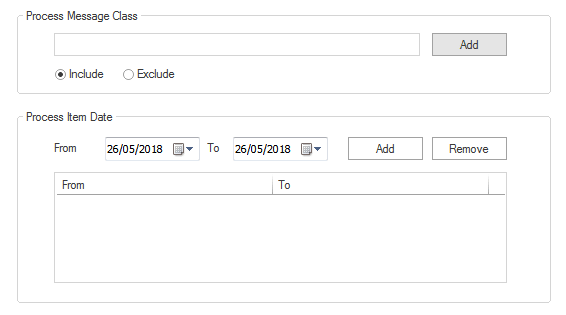 Date, Item type (Email/Task/Appointment etc). The software automatically map mailboxes of the source with destination according to the mailbox owner. One can also map the mailboxes manually in case the source mailbox and destination mailbox having a different owner or same owner with a different name. 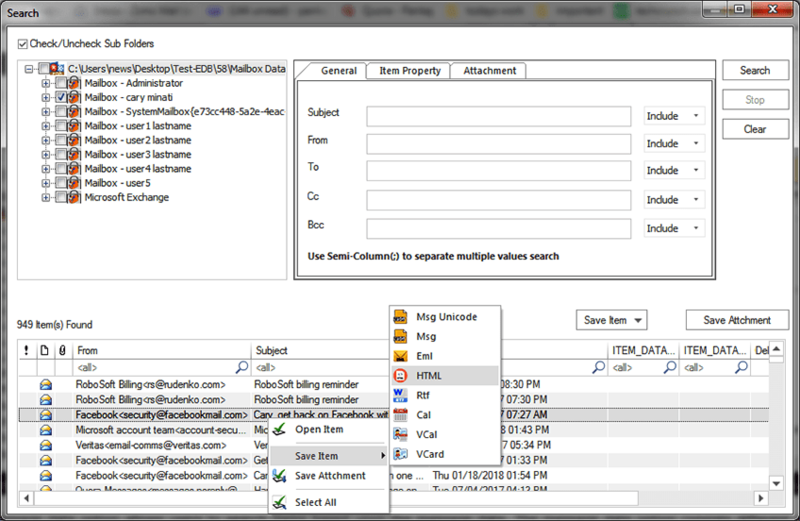 The tool enables to preview folder hierarchy of mailbox, item details once it is added into software source. Does the tool capable to perform without having Outlook Installed? No, User must install Outlook prior to Shoviv Exchange server suite installation. It supports all Outlook version i.e., 2016 & lower version. 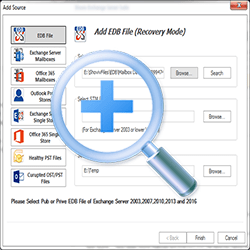 Which File type supported by Shoviv Exchange server suite for recovery? 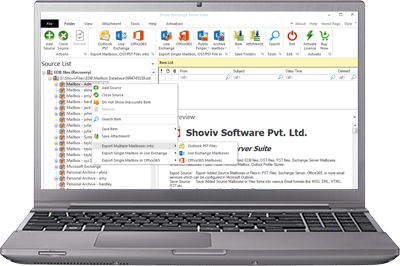 How many Email Client supported by Shoviv Exchange server suite? 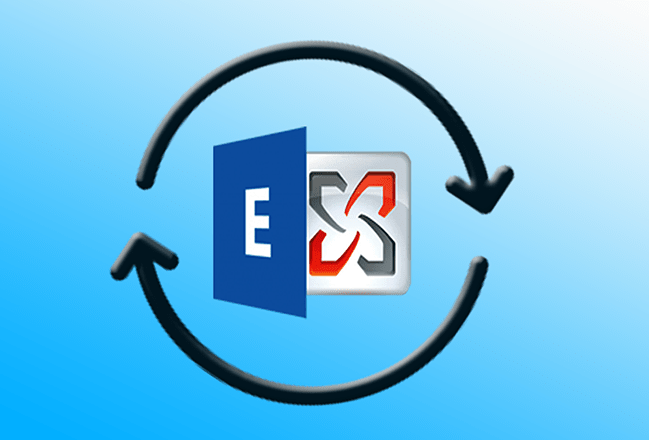 Does Shoviv Exchange Server suite Export Multiple PST Files into Exchange Server & Office 365? Yes, it perform such tasks in flawless manner. 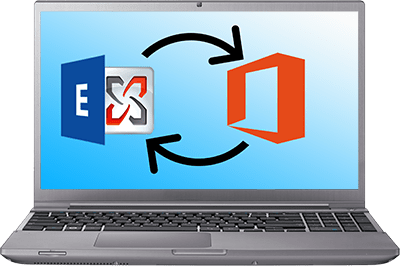 Does Shoviv Exchange Server suite Export Multiple OST Files into PST, Exchange Server & Office 365? Yes. 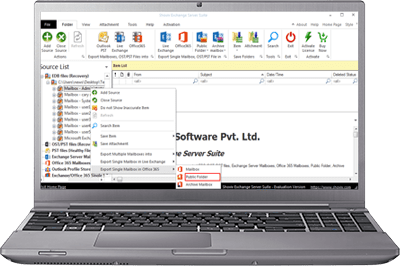 User can export multiple OST files into PST, Exchange server & Office 365 in one go. 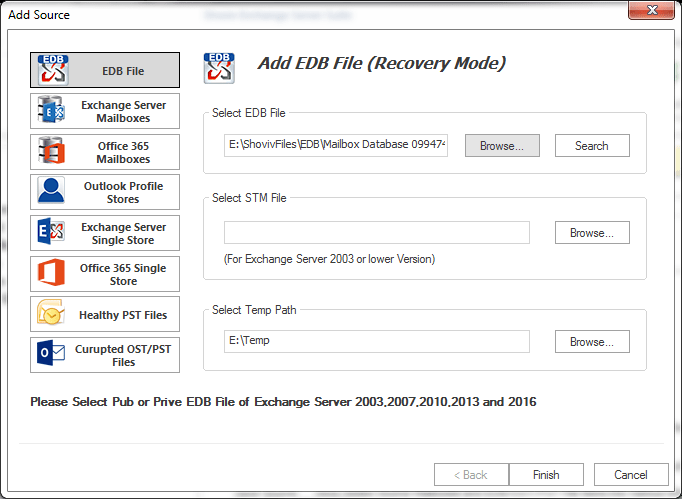 Does Shoviv Exchange Server suite Export Multiple EDB Mailboxes into PST, Exchange Server & Office 365? 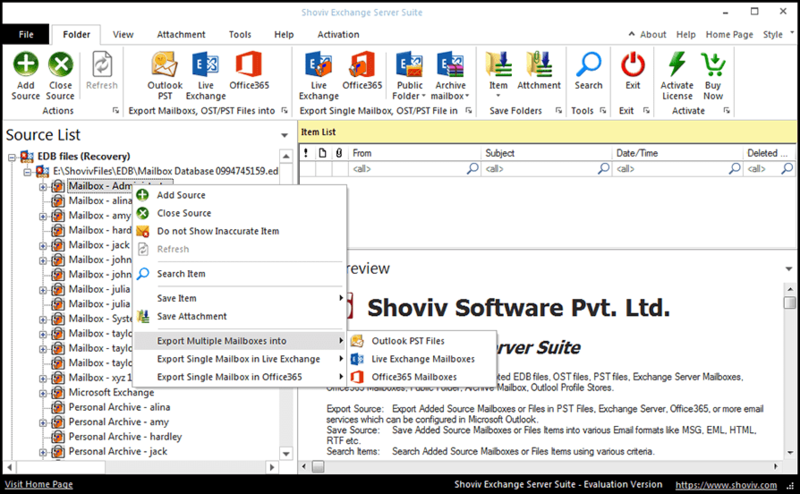 Does Shoviv Exchange Server suite Export Multiple Live Mailboxes into Exchange Server & Office 365? 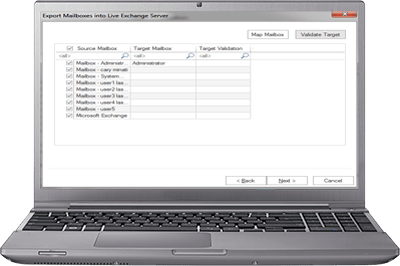 Yes, User can export multiple live exchange mailboxes into Exchange server & Office 365. 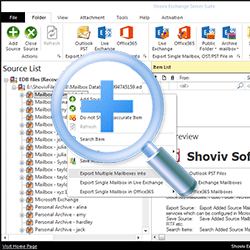 Does Shoviv Exchange Server suite helps to delete any item or data from added source? No, one cannot delete any item or data from added source.